Following 6:00 p.m. worship service, join the Women’s Auxiliary of Congregation Emanu-El for Shabbat Dinner as we welcome guest speaker Major General (Res.) 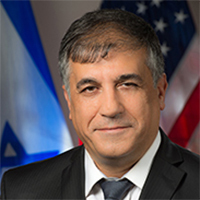 Meir Klifi-Amir, National Director and CEO of Friends of the IDF. Rsvp by Monday, April 1St. Cost is $50 for Women’s Auxiliary and Men’s Club members; $60 for all other temple members and their guests. Established in 1981 by a group of Holocaust survivors under the leadership of John Klein z”l, FIDF is a 501(c)3 not-for-profit corporation that operates 20 regional offices in the United States and Panama, with headquarters in New York City.